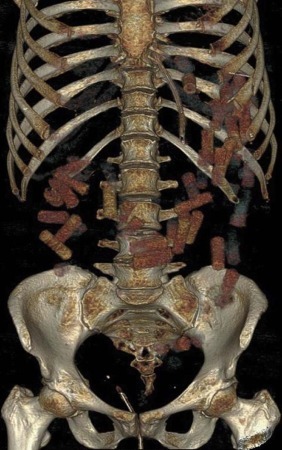 Computed tomography scan demonstrating drug packets. Body-packing, or the internal concealment of illicit drugs, has been described worldwide and is typically used to smuggle drugs across secure borders. Body-packers who swallow or insert packets of illicit drugs into body cavities are at risk for acute toxicity and gastrointestinal obstruction. We present a case of body-packing that exposed the challenging ethical and legal aspects of caring for such patients. We bring them to the forefront of discussion in light of the growing opioid epidemic, because there are no specific guidelines for handling these complex situations. A 50-year-old woman visiting from Colombia with history of hypothyroidism presented with syncope. On arrival the patient was hemodynamically stable but apneic and hypoxic to 30% SpO2 on room air. She was given 1 dose naloxone with subsequent spontaneous respirations and increase of SpO2 to 95% on non-rebreather. Physical examination was significant for lethargy, decreased respiratory effort, and clear lung sounds. Initial laboratory tests revealed acute respiratory acidosis, mild transaminitis, lactic acidosis, and urine drug screen positive for opiates. The patient and her husband denied any opiate use. The patient was initially responsive to intermittent naloxone administration but later required continuous infusion, mechanical ventilation, and orogastric tube placement. Attempts to irrigate the orogastric tube were unsuccessful, despite chest film confirming placement. Follow-up abdominal radiography revealed gastric and pan-colonic foreign bodies. Abdominal and pelvic computed tomography scan confirmed high-attenuation foreign bodies throughout the gastrointestinal tract, consistent with drug-filled packets, without perforation (Figure). The patient’s husband voluntarily shared that the patient had ingested drug packets. Diagnosis of opiate overdose in the setting of ruptured heroin packets was made. Surgical and gastrointestinal consultants recommended conservative medical management. Ultimately the drug packets were expelled with an aggressive bowel regimen, and computed tomography confirmed no residual foreign bodies. The patient made a stable recovery. Clinical outcomes of body-packers are variable, and there are no absolute guidelines for management of colonic retention of opioids.1, 2 There have been increasing reports of drug packers being encountered by healthcare professionals, especially in major cities.3 Several reports have described better drug packing techniques being used and likely explain the increased reports of women and children being used as drug packers in recent years.2, 3, 4 These factors, along with the growing opioid epidemic, suggest that more healthcare professionals are likely to encounter patients with complications related to drug packing. This case highlights the ethical and legal dilemmas faced by healthcare providers when caring for patients who are body-packers. As physicians we have certain obligations to our patients, including maintaining the patient–doctor relationship and upholding patient confidentiality; as individuals of society we must abide by the law. These 2 aspects can be at odds in cases of body-packing. In addition, our role in questioning patients and their visitors on the circumstances leading them to their condition is not always imperative yet may be crucial in these cases. Without prior experience or definitive guidelines, we were forced to navigate this delicate ethico-legal situation on our own. There is a paucity of literature describing tools to handle such cases. We struggled to find a way to maintain a viable doctor–patient relationship that would allow for care without bias, a way to uphold patient confidentiality, and a way to cooperate with law enforcement and their investigation. In our case, we immediately involved social work, case management, hospital security, and hospital administration. Safety measures were instituted and included limiting all visitors. Hospital administration worked with local law enforcement to address any legal aspects of the case, specifically the handling of drug packets. The patient care team maintained their primary responsibility to the patient and her health. As the opioid epidemic continues to rise throughout the globe, the safety and health of patients who fall victim is imperative. We propose a need to establish guidelines outlining strategies to deal with major ethical and legal dilemmas encountered by healthcare professionals in caring for these patients.